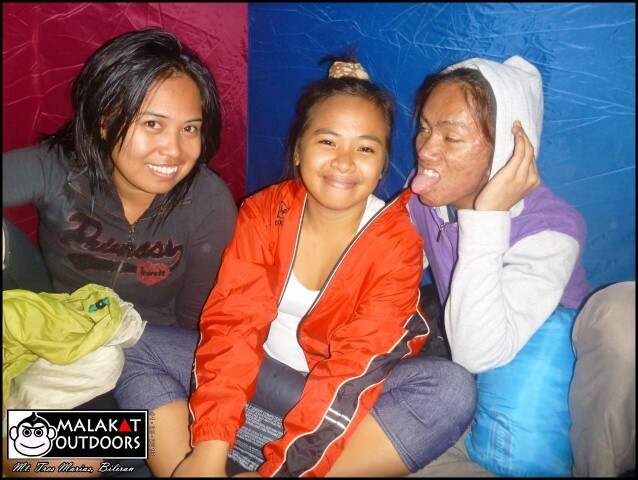 This is the 1st of 2 parts of my account for our Tres Marias expedition last January 26-27, 2013 in Naval, Biliran Island. Both our major and year opener climb of the same year. Our initial group was composed of at least 15 but dwindled down to 9 during the actual climb. 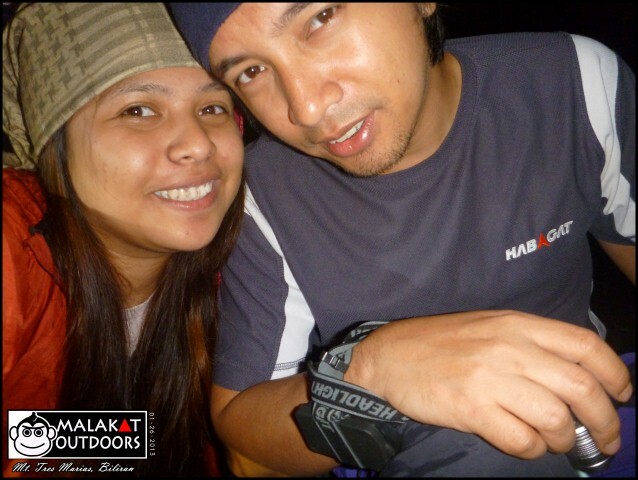 Carlo and Odessa missed the climb due to prior engagements. Rod had to beg off because his mother got sick. 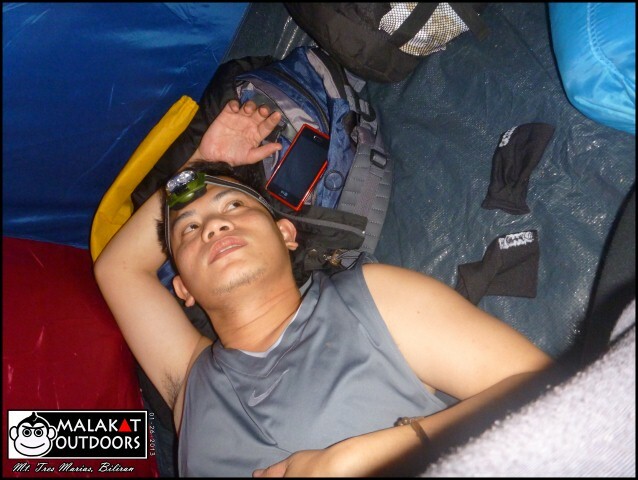 Arn, Raj and Nikko, who joined our training treks, also didn’t make it due to other reasons. 2 days before the climb, Leyte was being flumped by a threatening monsoon and I was worried as Leyte (being born and raised there) seems to rain all year round. Luckily, the weather cleared up 24 hours before January 26 which assuaged the worrisome me. And I couldn’t help but worry. Due to our schedules, it was anticipated that we would reach Naval late afternoon by which time, if we would decide to push through, would force us to trek through the night. One which I highly disfavor. Night treks compound the capacity for error. A lost trail, a slip through a ravine, a dangerous viper around the bush, a wrong footing when crossing the river. The scenarios are scarily, limitless. Rain, would spell disaster. 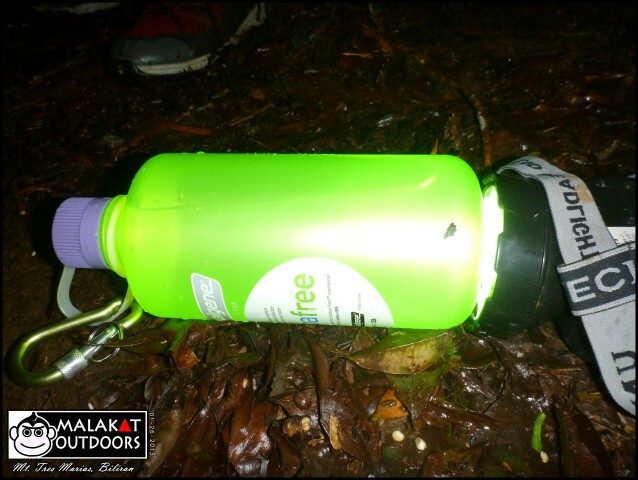 On time and in high hopes – our butane canisters didn’t make it through the check though. Rain being cute here. Free ride from Ormoc to Naval, albeit took a while. I think Princess enjoyed the ride because of the hunk who sat beside him. 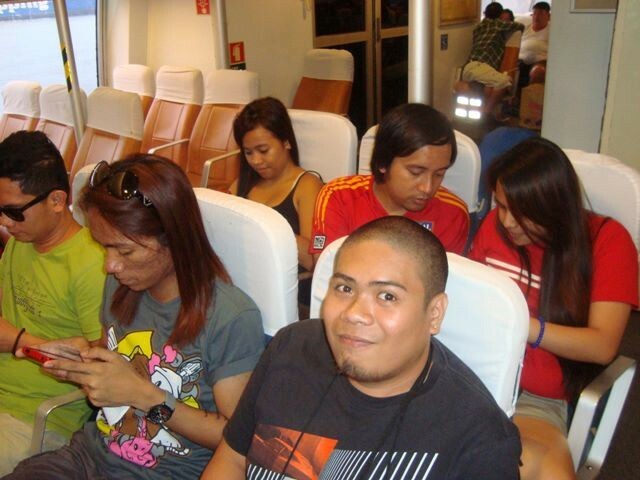 We arrived at Ormoc Pier at 1:30PM and was at Leyte, Leyte by 2:47PM. Biliran was now only an hour away. We disembarked at the Naval terminal after what we all thought was a very long ride. Maam Aideen, who was with us since the Supercat ride, shared the same sentiment. Everyone, aside from me, then took a hurried lunch at a local eatery whom we later got to know was owned by one of our companions, Chad. And because butane and other liquefied gases are not allowed to be transported through air and seacrafts, I was left with no option but to leave our butane provisions at the Cebu Pier. Butane costs mighty high at Naval. One canister costs a whopping Php 110 costing twice than the ones sold at Cebu. Last minute preparations at Maam Aideen’s place. The jumpoff was still a ride away and since we failed to hit the required passengers, we were left with no other choice but to take the local habal-habal (instead of a trusty elf truck or jeepney). Yet another aspect of mountaineering which I highly dislike. And my instincts were correct. Princess, Gretchen and Jason who shared the same motorcycle met an accident when their motorcycle lost balance because of a stray German shepherd who apparently got loose from his leash. 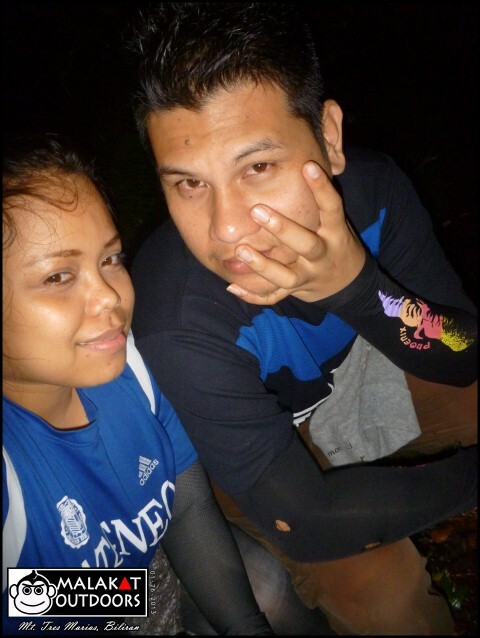 Princess suffered some cuts in the knee which thankfully didn’t hamper him throughout the entire climb. The poor driver bruised his arm and the side mirror of his motorcycle broken. The irresponsible dog owner didn’t even bother to check on us. I’m screaming civil liability as I write this. On a side note, there is a law that requires dog owners to always have a leash on their pets when outside their premises. Lara, myself and Te pai also got into an accident. 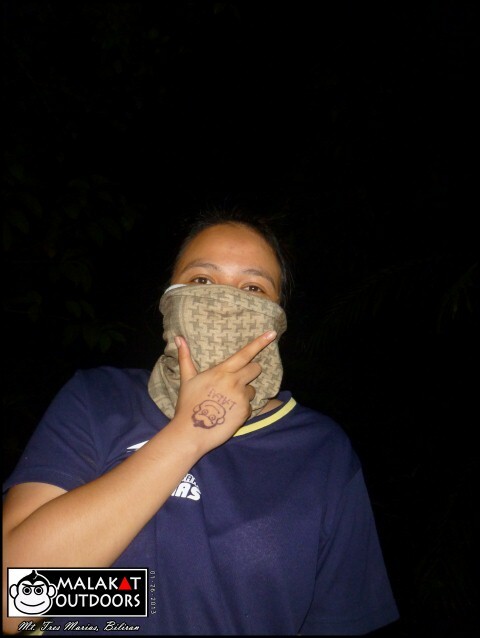 In a junction toward Brgy Sampao, it seemed that we were too heavy on the backside of the trike which caused the nose of the motorcycle to veer towards the air. Thankfully, none of us suffered injuries other than my reinforced hesitations towards habal-habal rides. We started trek proper by 4:50PM after a quick prayer and then through a muddy uphill section towards the irrigation trail. Omnigrip failed Lara at some areas in these ascents. An hour after, night began and we were then at irrigation proper. Sufficiently called because water from the vaunted falls is deviated towards the ricefields abounding Brgy. Sampao. This irrigation extends to what I believe is 2.5km – 3 kms in length. 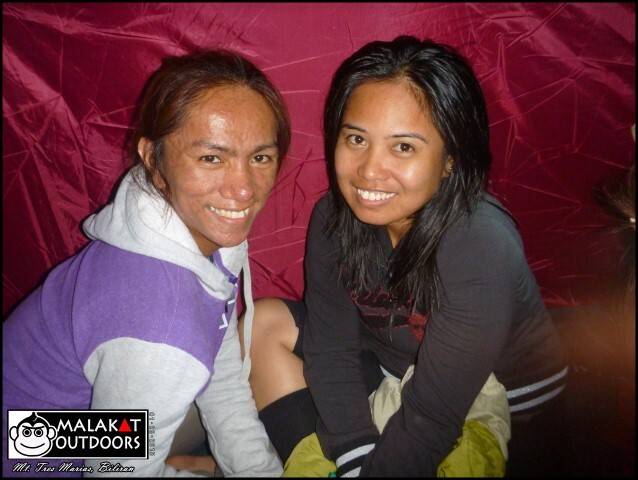 Our plan was to push through with night trek and make an emergency camp 2 hours away from the Aeta Camp, the main campsite. First rest of the climb after our ordeal through the muddy section. This is before the irrigation trail. Lara’s Omnigrip shoes on her maiden major climb. And trek through the night we did. It helped that everyone was psychologically prepared. 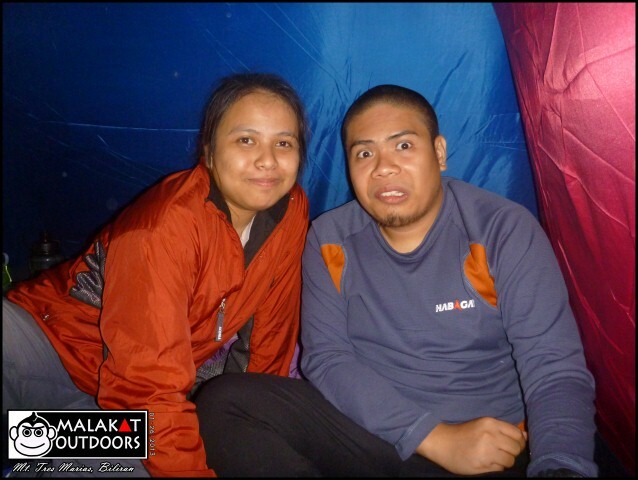 We anticipated night trek and everyone came ready with headlamps (except me!). 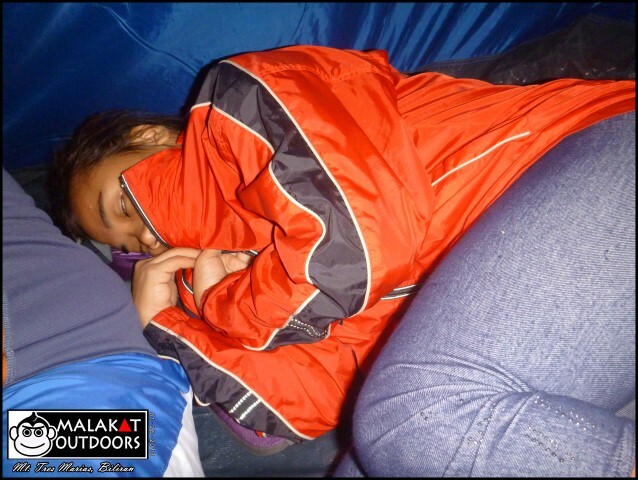 As an excuse, our guide and I previously agreed to ditch the Aeta campsite, sleep early on day 1 and rush on things on day 2. But plans change and it did for our climb. And I will forever be indebted to Te Pai (as we fondly call Ate Pai) for her trusty penlight. 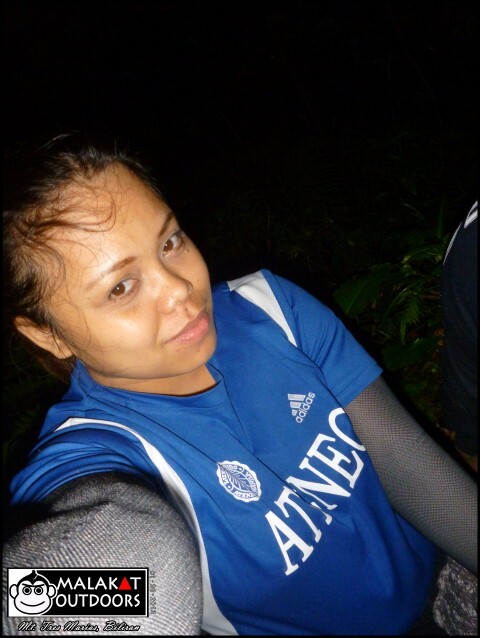 Our guides would later inform us that we were the first group to ever attempt a night trek to Tres Marias, a first even for themselves. And we found out why the day after, almost in disbelief that we did. Some sections of the irrigation trail are literally edges of mountains where a slip could send your careening down to your death or drowning within the river. 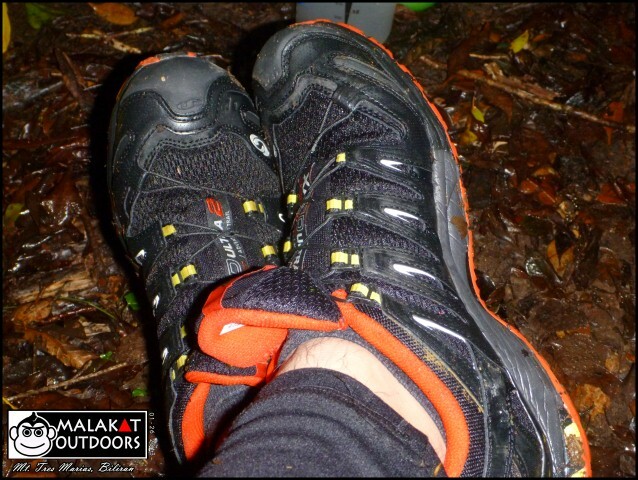 My unsolicited advice to those who attempt a night trek, please do so with care! But we never knew about that during the evening. Instead we marched on with no care other than making sure that we not slip and reached the end of the irrigation trail at 8:15PM (roughly 3 hours after we started) where we decided to take a breather and take our dinner. Our meal consisted of pork, dried fish and hot soup. We refilled water which tasted as good as nature’s spring can be. 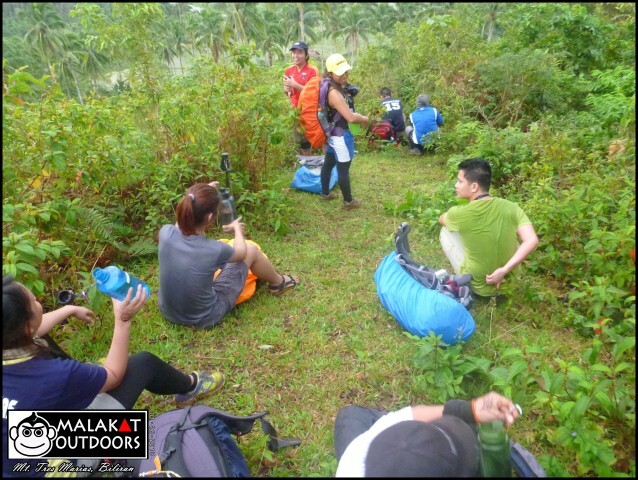 Our group was in high hopes and cheerful as ever evident that our training climbs/treks did pay off well. I forgot to ask the name of the place but I will remember it by heart as this was where we saw the viper which was only a few meters away from me the day after. Chenz, pictorials while dinner was being prepared. Mai2’s new Nalgene in action. 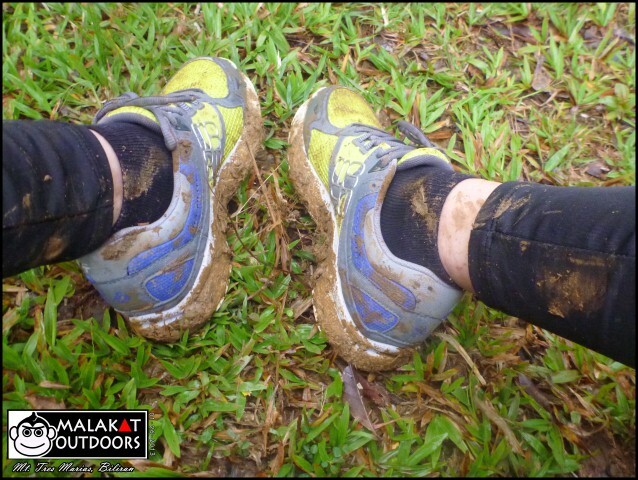 Salomon shoes taking a breather. We finished dinner at around 9:30PM and we then started assault proper to e-camp. This was the entry to the mountainous section comprised of assault which lasts for about 45 minutes. Our planned e-camp site however turned to be a dismal fail. It was small to accommodate all our tents and no trees/branches to hold the hammocks of our guides. 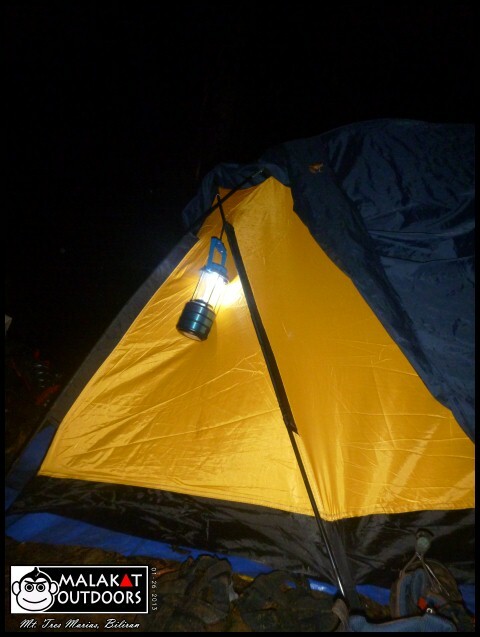 We ventured forward and initially thought of camping within the trail. 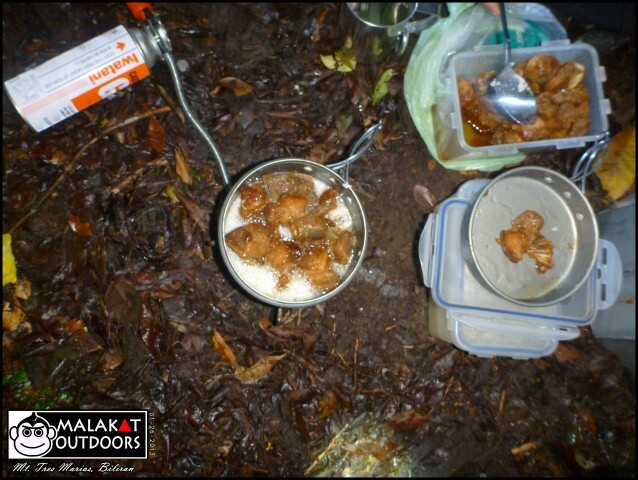 A group decision however was made to move push forward to the main camp which we would later accomplish at 10:45PM. 6 hours in total with minimal rest but a lengthy dinner rest. 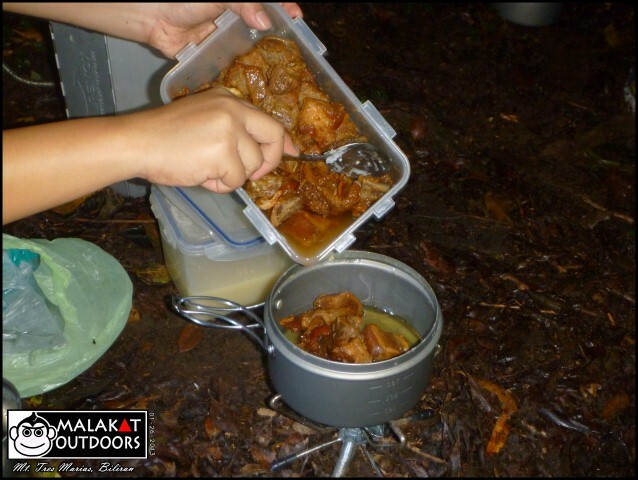 Trek like a mountaineer, eat like a King. The Aeta campsite is beautiful. A log cabin would add grandeur to the picturesque charm of the campsite. High above, a single full moon shone (lain sad ug duha) breaking through the canopy of the aged trees. I would liken it to staring above the tall buildings in the metropolis. In pure awe. Only on here the air is cleaner and the trees are the ones staring back at you. It is both beautiful and majestic. Since we were done with dinner, we proceeded to our socials nevermind if some of us haven’t slept yet since 26 hours ago. I would belie if I would refer to my companions as hardened mountaineers but these are people who last slept 26 hours ago, trekked for hours and still have the prowess to take a drink! I loved the socials, we got to know more about our guides and their companions. Boisterous Intoy, mysterious Chad, silent Zaldy & the beautiful Maam Aideen. 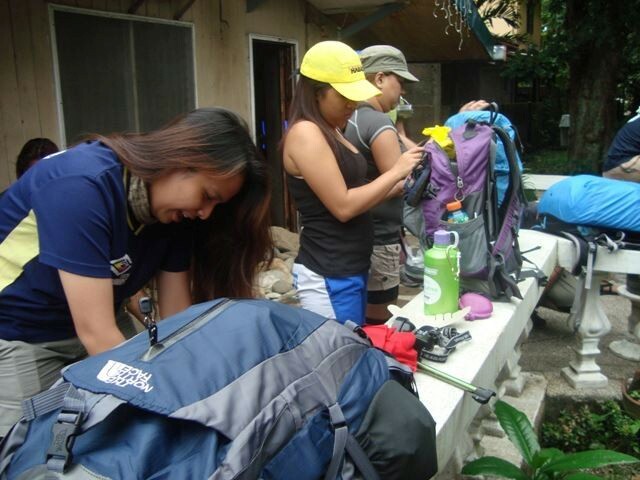 Their stories, of their group members specially, will always make Tres Marias a memorable climb for me. Lara and me, I think, presocials. 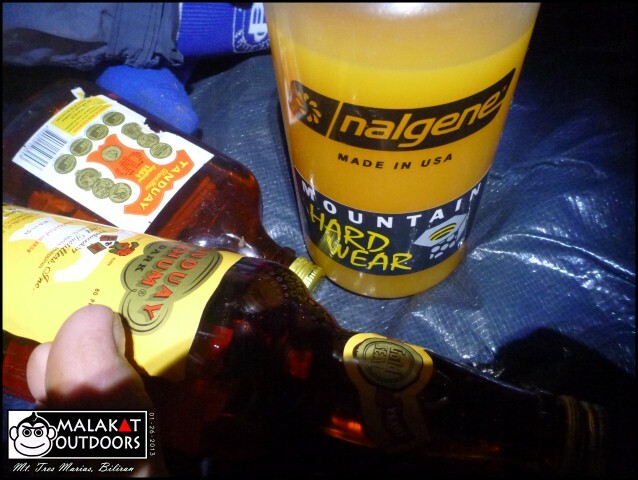 Tanduay & orange juice – our poison of choice. Lara & Rain goofing around. Must have been the drinks. Pictorials mid socials, (L-R) Myself, Zaldy, Maam Aideen, Intoy & Chad. 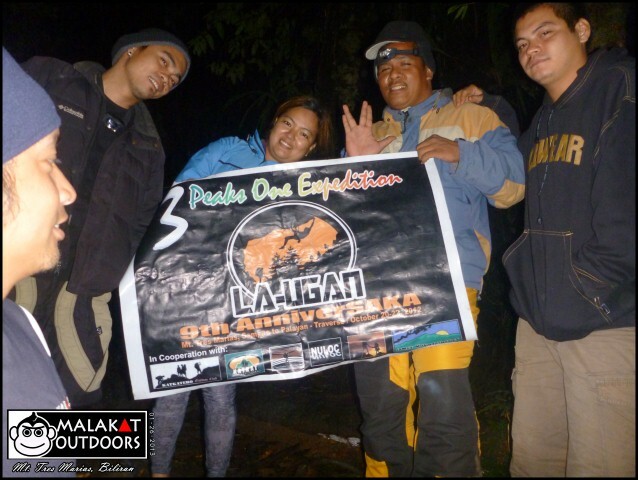 Our La-Ugan Mountaineer guides. Princess & Te Pai, cute mode. Mai2, in sleepy mode na. ang ganda po ng blog at nakita ko ang ganda ng expi niyo noon dito. may plano po ang grupo ko umakyat. tanong lang po namin magkano po ang rate ng guides dito at kung may mai-share po kayo contact number na rin po nila. maraming salamat po. more power at God bless. i thought about glitters when i read my name. why? hahaha. on the other hand, i like how the words flowed. haay. the proud beau that i am.